Such a wonderful book. So many great recipes and lore. Made most of the ragus from this book with consistently great results. 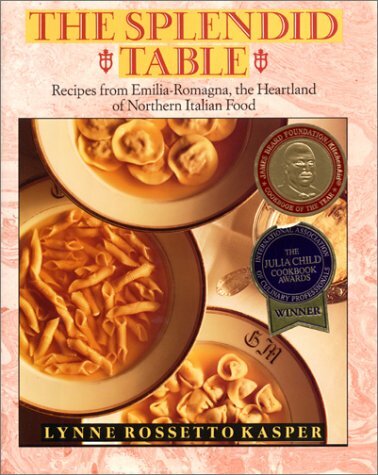 Great history of Emilia Romagna, and wonderful recipes. One of the few cookbooks I have read cover to cover. One of my "go to" books. This is one of the best Ragu's ever! Served this with the homemade tagliatelle pasta from this book. Excellent -- my only caveat is that I won't use gizzards with the giblets any more. Hearts and livers were fine, but the gizzards had an unpleasant texture. This is a great broth. It has a lot of depth of flavor and works very well in a soup. I used beef back ribs, turkey necks, turkey wings, and a capon neck to make the stock. I brought the meat to the boil in water, strained and discarded the water, and then pressure cooked the ingredients in fresh water for 4 hours. I used brown chicken stock and found that it rather dominated the flavor of the sauce. The prosciutto seemed almost like an afterthought. This was fabulous. Served with the asparagus Parma-style from the same book. There are a lot of recipes for sausage based pasta sauces with tomato. This version if fine but isn't particularly special. I've made easier versions that tasted better. p. 114 - calls for Italian sausage without fennel. Sauce is seasoned w sage. p. 114/5 - First use of this recipe. Sweet Italian sausage is sliced and browned then removed from the pan. In go the diced carrots and onions along with fresh parsley. The sausage then added back in along with chopped garlic and the lovely sage leaves. Once the wonderful garlic aroma permeates the air, tomato paste, wine and . . . get this, ground cloves are added. When the pasta is almost cooked, a 14oz can of tomatoes are added to simmer slowly. Pasta and parmesan are tossed in the sauce and, served family-style. With the assistance of the food processor, this dish essentially comes together in the time it takes to cook the pasta (including the time to bring the pasta water to a boil) and you’d never know this since the sauce is so rich with deep flavours. Finely diced, the carrot and onion just melt-away to thicken the sauce. Rich, delicious and oh-so-tasty, this was a lovely pasta dish that we hungrily devoured and will definitely be made again. I was worried that this would be too much starch upon starch, but the lentils as prepared are really delicious- possibly the best tasting lentils that I have ever made. Definitely a keeper. This is one of the best things I've ever made. It was very popular as a first course for our Christmas dinner. The tortellini are bursting with flavor and the broth is amazing. I ended up with lots of extra filling and a lot of pasta scraps so it would be easy to make a larger number of tortellini. p. 229 - This delicious dish came together in no time once the individual components were made. I purchased my fresh pasta and, used fresh borlotti beans vs dried so my cook time and method differed somewhat.The tomato sauce is the heart and soul of the recipe in my view. Pancetta is rendered in olive oil prior to adding parsley and onions to the pan to cook to a rich brown colour. Garlic and basil are then added along w some tomato paste and all is mixed together prior to adding in 28oz of tomatoes. This mixture then simmers for 5 mins prior to adding in the beans. In my case I simply allowed the sauce to simmer for 1.5 hrs prior to adding my cooked borlotti beans.This made for a rich, hearty, simple and delicious meal. I was surprised that the pancetta flavour was discernable in the final dish given that only 2 oz were used. The flavour of the pancetta definitely added to the richness of the sauce. I’d recommend this recipe without reservations. These were just terrific.They were a bit fussy, but because you can prepare them ahead of time, by the time you eat them you’ve forgotten anything that annoyed you during the prep. I can imagine piling these on a platter and serving them as an hors d'oeuvres. With plenty of napkins. Mmm-mmm good. p. 179 - This was a tasty and different way to serve roast chicken. Chicken is rubbed w a garlic/salt/rosemary/evoo mixture and rosemary sprigs are placed in its cavity prior to wrapping and refrigerating overnight. After roasting the bird the following day, cut pieces of chicken are drizzled w high quality balsamic. Such a simple preparation but the quality of these ingredients take this dish from good to outstanding. What I especially love about this book is all the extra info that accompany's each recipe. From wine recommendations to regional variations, LRK has it covered. Another wonderful dish from this book. Agree that this is a simple preparation -- and because of that, quality of your ingredients is important. I splurged on organic, air chilled chicken and the best evoo/balsamic I could afford. Boy, were the results worth it. The capon turned out very well. It was tender and juicy. That said, I'm not really sure this recipe really added a whole lot as it's rather simple. This is a lovely dish. The roasted rabbit is cooked whole. Total cooking time is 1 hr, 45 minutes. The timing was perfect for a 3.5 lb. rabbit. I've never cooked a whole rabbit before, all my other recipe calls for parts. After the first 30 minutes, I added new potatoes and baby carrots to the sauce and a few extra whole garlic cloves. Served it with the Garlic Sauteed Cabbage (p. 331). This was delicious. Sometimes I think red wine overwhelms the flavours in a braise, and maybe next time I might try white wine, but it was a lovely dish with creamy polenta, a bit reminiscent of a Greek stifatha with the spices. Very tasty -- makes a great accompaniment for the tagliatelle with Prosciutto di Parma. I was really surprised by how much I liked this. The flavor was good without being overwhelmingly earthy. I did use orange beets. I think this would be especially pretty with chioggia beets. This was a nice enough cake but I felt it was a bit dry and, while I normally like peanut butter a lot, it didn't really work for me here. This is excellent, best warm. Use a regular cake pan, not springform, the batter is too runny. Try it with grated orange zest and chopped orange peel. Award Winner! Julia Child Book of the Year. Premier cooking teacher details 200 recipes from Emilia-Romagna, heartland of northern Italian food. A 56-recipe pasta chapter including many never before seen in America. From fast and easy dishes such as Linguine with Braised Garlic and Balsamic Vinegar to a lasagne of chicken, pine nuts, and currants. A veal Parmigiano like no other-Pan-Fried Veal Chops with Tomato Marsala Sauce, the whole finished with curls of Parmigiano Reggiano cheese. country dish of braised lentils with ribbons of pappardelle and crisp nubbins of pancetta; Tortellini of Artichokes and Mascarpone; or Fresh Tuna Adriatic Style. Straight out of the Renaissance but perfect for today, a sumptuous tortellini pie, ideal for important dinners and holidays. A salad of tart greens, Parmigiano-Reggiano cheese, and Prosciutto di Parma with a warm garlic and balsamic dressing and many other antipasto dishes. Over thirty dessert recipes including Chestnut Ricotta Cheesecake and Torta Barozzi, a mysterious chocolate cake made at only one pastry shop in the entire region. A Guide to Ingredients that shares the secrets of how to select, use, and store the very best balsamic vinegars, olive oils, porcini mushrooms, Prosciutto di Parma, mortadella, Parmigiano-Reggiano, coppa, fresh herbs, and much more. Encounters with Lucrezia Borgia, Gioachino Rossini, Napoleon's Empress Marie Louise, Giuseppe Verdi, Arturo Toscanini, Carlo Bergonzi, Renata Tebaldi, and Luciano Pavarotti, all characters in the epic of Emilia-Romagna. The Splendid Table is the Italian cookbook America has been waiting for a book firing our passion for Italian food while responding to our health concerns. It not only reveals Italy's best-kept culinary secret, the great cuisine of Emilia-Romagna, it is at the same time one of the most important teaching books of our era. Know it will become a good friend, well thumbed and lovingly stained over years of good cooking and good reading.